Outline: Adam and Eve fell into sin. Christ is the way out. For children. Hi! Are you ready for another story? A true one? Well - You remember about Adam and Eve and the beautiful garden of Eden that God made for them? I told you that for a while, they were very happy in that beautiful garden. Now this is what happened. God told Adam and Eve they could eat of the fruit of all the trees in the garden - except one. They must be sure not to eat the fruit from the TREE OF KNOWLEDGE OF GOOD AND EVIL. If they did, they would die! 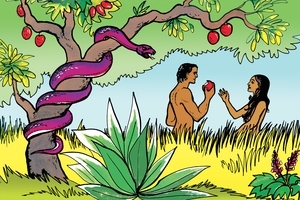 One day Satan came in the form of a serpent, and told Eve that if she would eat the fruit of that tree, she would be like God - and know everything. Of course she shouldn't have believed such a thing, but she did. And she took of the fruit, and gave some to Adam, too. And they both ate it! No sooner had they eaten it than they knew that they had sinned. (And you know what happens when you sin - it makes you feel very unhappy.) So when God came to talk them, they were afraid and went and hid. That was kind of foolish, wasn't it, because of course you can't hide from God. God was very sorry that they had disobeyed Him, because there hadn't been any sin or bad things there. But now because they had disobeyed Him, they had made sin to come into the world. Well, when people sin, then they must be punished. So God told them they couldn't stay in the garden any more, and that they would have pain, sickness and hard work, because that's what sin makes. And God told Adam that he would have to work hard to take care of any garden now, where thistles and thorns and weeds would grow, and make it hard for him. So Adam and Eve went out of the garden, and were very sad to leave it. Then God put angels to guard so they couldn't come back to Garden of Eden. So now when I prick my finger on a thorn I remember how terrible it is not to obey God. For ever since, there has been sin in the world and that's why people are so unhappy. For you and I know that sin always brings unhappiness, and punishment. Well, I guess you're thinking what I am, aren't you? That's a sad story - but there's a happy ending to that story. Would you like to hear it? All right. You see, God made Adam and Eve and the other people, and you and me, because he loved us and wanted us to be His children - and love Him. But when sin came into the world and people were wicked, it spoiled everything. God said that sin had to be punished, and that the wicked, sinful people couldn't be His children, and go to heaven to be with Him. Of course He wouldn't want sin in heaven. But He still loved us all, and still wanted us to be His children. So the He did something wonderful. God sent His only Son, Jesus, down to this world, and let Him be punished for our sins. He died for our sins so that we wouldn't have to take the punishment. The Bible says so. It says: "For God so loved the world that He gave His only begotten Son that whoever believes in Him should not perish, but have everlasting life." So if you believe on Jesus and ask Him to save you from you sins, you can be a child of God right now. You will be born into God's happy family, and He will be your loving Heavenly Father. And that is the most wonderful thing that could happen to anybody. GRN has recorded a version of this script in 57 languages and dialects. See full list.